Redesign makes it easier to identify, understand problems to make rapid changes to configuration. NGINX Plus Release 7 (R7) comes with a completely redesigned dashboard. The new dashboard makes it even easier to identify and understand problems with your infrastructure and make rapid changes to your configuration. A new Dashboard tab provides a high-level overview of the health of the system and the traffic going through it. From there you can drill down to more detailed information about virtual servers and back-end servers configured in NGINX Plus. 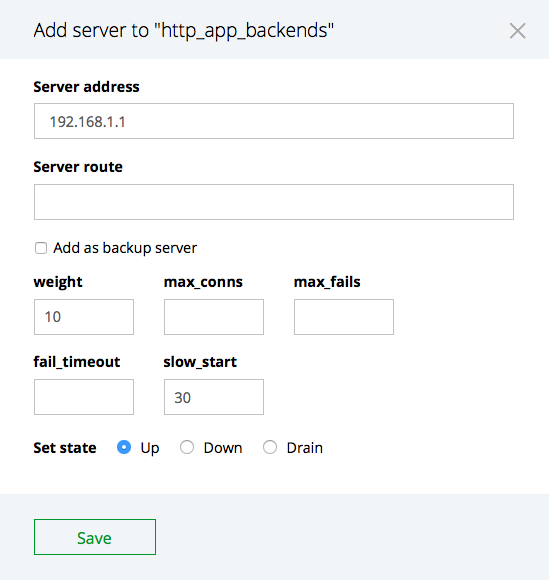 You can even make temporary changes to your load-balancing configuration, such as adding, removing, and modifying back-end servers, all from the dashboard. A live demo of the dashboard is available here. Read on for an overview of the new NGINX Plus Dashboard. A new Dashboard tab gives a complete, single-page summary of NGINX Plus activity and of the health of your application. The current health of your application – The Upstreams and TCP upstreams boxes report numbers of healthy and failed servers. The current load on the system – A large number of Active connections in the Connections box or Req/s in the Requests box can indicate a system that is under heavy load or DDoS attack. The seriousness of any problems – Red, yellow, and green indicators throughout the dashboard visually identify serious errors and warnings or let you know everything is ok.
General system information – The top left box reports the NGINX Plus version number, the server’s IP address, the PID of the NGINX Plus master process, and its uptime. And a wealth of additional information on the state of your application. After identifying problems on the Dashboard tab, you can quickly drill down to learn more about them. The new dashboard has a row of tabs along the top for easy navigation. The tabs have red, yellow, and green indicators for quick and easy identification of health problems. There is a tab for each box in the bottom row of the Dashboard tab. The Server zones and TCP Zones tabs provide data on the front end of NGINX Plus, where it interacts with clients and web browsers. 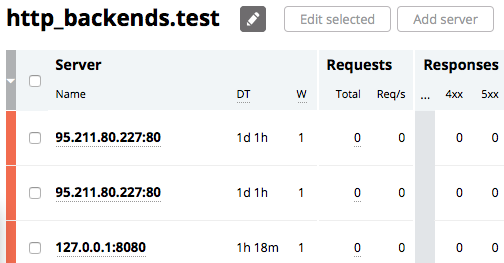 The number of incoming client connections and requests are examples of the data included on these tabs. The Upstreams and TCP Upstreams tabs provide data on the back end of NGINX Plus, where it interacts with back-end servers. A new interface on this tab enables you to temporarily add, remove, or modify the servers in each upstream group . The changes are temporary (they do not persist across a software reload or restart of NGINX Plus). The Caches tab displays the status of your content caches. The Server zones tab gives detailed statistics on the front-end performance of NGINX Plus. Statistics are reported per HTTP virtual server as configured with the server directive in the http block. For NGINX Plus to collect information for a virtual server, you must include the status_zone directive in its configuration block. The Requests and Traffic sections provide a good indicator of system load. For example, large values in one or more of the Req/s, Sent/s, or Rcvd/s columns indicate heavy load or potentially a DDoS attack. The Responses section breaks down responses sent to clients by response code. A large number of 4xx and 5xx errors can indicate issues with your application. The Upstreams tab provides information about each group configured with the upstream directive, which are the back-end servers NGINX Plus reverse proxies and load balances to. The Upstreams tab is specific to upstream groups for HTTP and HTTPS traffic (TCP traffic appears on the TCP Upstreams tab). The statistics on this tab are similar to those on the Server zones tab, the difference being which connections they are collected for. The Server zones tab reports statistics about connections between NGINX Plus and clients, whereas the Upstreams tab reports statistics about NGINX Plus talking to back-end servers. Toggle the Failed only switch in the top right corner to quickly display only failed servers across all upstream groups. Setting this switch to on resets all the local filters below it. The Responses section breaks responses down by response code. A large number of 4xx and 5xx errors can indicate issues with your application. The statistics in the Requests and Traffic sections indicate how evenly traffic is being distributed across the servers in each upstream group. The Conns sections displays the number of active connections from NGINX Plus to each server, along with the connection limit (if you have configured one with the max_conns parameter to the server directive). You can also add, remove, or modify the servers in an upstream group by clicking on the pencil icon next to its name. After you click the pencil, the Edit selected and Add server buttons appear. Except for the Server address, the remaining fields are optional and have default values. If you do not click a Set state radio button, Up is selected by default. For details on the configurable fields please see the documentation for the server directive. From here the various parameters of the server can be modified, or it can be removed altogether. NOTE: Please keep in mind that these changes are made using NGINX Plus’ upstream_conf interface and do not persist across a reload of the configuration or a restart. Use this interface for temporary or short-term changes such as setting a node to drain or tuning the weights of nodes. For permanent changes, you must update the NGINX Plus configuration file. The Caches tab provides statistics about the caches configured in NGINX Plus. The State of the cache: whether it’s ready to be used ( ) or isn’t ready because metadata is still being loaded into memory( ). The Capacity bar shows how full the cache is. When it’s at or near 100%, increase the size of the cache to avoid having data deleted from the cache even though it’s being accessed frequently. The Hit ratio dial tracks how well the cache is performing. A low hit ratio indicates that most responses cannot be satisfied the cache and require going to back-end servers. For help on tuning the cache, please see this blog post. The TCP Zones and TCP Upstreams tabs provide the same kind of information as the Server zones and Upstreams tabs, but for TCP-based applications rather than HTTP applications. Tooltips throughout the dashboard give more detailed information about upstream servers, configuration reloads, cache status, and any error messages. Published at DZone with permission of Patrick Nommensen , DZone MVB. See the original article here.